On Tuesday 13th December 2016, 30 secondary school students will be awarded for their investigative skills as amateur forensic seismologists. Using jAmaSeis software, students were challenged to determine the location, size and depth of specific seismic activity and present their process and findings via a creative video. Videos are available for viewing on NIHERST’s YouTube Channel: Shake Squad Mission 2016. This competition entitled ‘Shake Squad Mission’ is just one part of the larger Seismology in Schools programme, currently enjoyed in this pilot phase by seven secondary schools. The programme aims to promote understanding of science concepts through classroom activities that focus on seismology and earthquakes as a unifying theme. Activities include building a seismometer, collecting, analyzing and sharing data using information communication technology. Thus far the programme has been highly successful in stimulating students to read physics and mathematics to A-level and thus qualify for university courses in science and engineering to meet manpower shortages. Recently, with the 6.2 magnitude earthquake and numerous aftershocks experienced by this country, students were able capture and analyse real-time seismic readings. Using the seismometer installed in each school by NIHERST in collaboration with the University of the West Indies Seismic Research Centre (UWI SRC) and the Ministry of Education, as well as the initiators of the programme – The British Geological Survey, the University of Leicester, the Imperial College London and Durham University, students recorded and accessed real-time earthquake waveform data. Along with the UWI SRC, students then compared their findings to discuss the implications of this tectonic activity. The data collected by the schools’ seismometers are available in real time on the international seismology network of the Incorporated Research Institutions for Seismology (IRIS). Earthquakes capture the attention of students and the public alike. While they can frighten, they should also inspire us to explore the Earth. This programme allows students to undertake the role of a seismologist within their own classroom. This is especially valuable in a country like Trinidad and Tobago which lies above active fault lines and where, contrary to popular belief, earthquakes and not hurricanes are likely to be the largest natural disaster that we face. 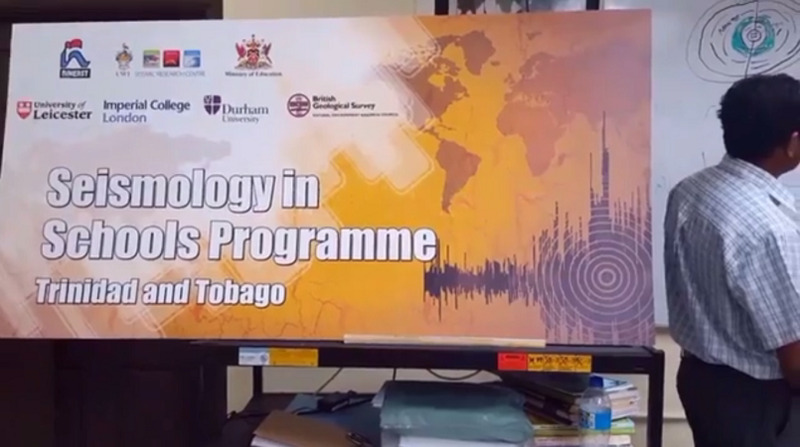 Launched in Trinidad and Tobago in 2014, the programme is an adaptation of the successful Seismology in Schools project developed in the UK and adopted by over 500 schools around the world. NIHERST has partnered with the Ministry of Education and the UWI Seismic Research Centre (SRC), as well as the institutions at the helm of Seismology in Schools in the UK - University of Leicester, University of Durham, Imperial College and the British Geological Survey (BGS). The programme introduces the science of geophysics to students from forms three to six, and give them hands-on experience of seismology. They will get a taste of how scientists work and see the physics, geography and mathematics principles being taught in the curricula come alive in real world situations.